Stopping animal cruelty is difficult enough when it's done in secret, but when it happens legally and out in the open, ending it can be just as challenging. A tragic case in point: greyhound racing -- a cruel and senseless "sport" that not only kills or injures thousands of dogs every year across the country, but loses money for the places that operate them. State governments are often losers too, having to spend more to regulate the sport than they get back in revenue. Florida alone lost between $1 million and $3.3 million on greyhound racing in 2012. So why is this abomination still in business? Because for some, greyhound racing is still big business. Greyhounds begin their lives on breeding farm, where only a select few actually become racing dogs. 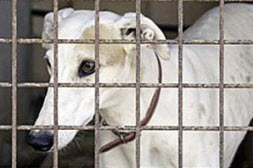 Unwanted pups, those who assessed as unfit for racing, are killed or sometimes sent to laboratories, which use them in experiments. Those chosen for the sport spend most of their lives stacked in double-decker cages in warehouse-style kennels for 20 or more hours a day. Most of the areas greyhounds are kept are not heated or air-conditioned, causing many to suffer during severe weather temperatures. Many also suffer from fleas, ticks and internal parasites. While this is enough for most states to turn their backs on the ugly practice, greyhound racing still exists in seven states. More than half of all active American tracks -- 12 of 21 -- are in Florida, where a ridiculous law requires gambling institutions to maintain and run dog racing facilities. You read that right -- if you want to run a gaming institution in Florida, you must, by law, race dogs as well. More about that oddity in a moment, but first know that when these dogs are sent out to race, many are actually sent to their deaths. Making use of a recent Florida law requiring that dog track deaths be reported, the greyhound protection group GREY2K USA, with ASPCA help, put out a report last month revealing that 74 racing greyhounds died at ten different racetracks in Florida over the last seven months of last year. Put another way, from June to December, a greyhound died from a racing-related injury every three days. And only two months into 2014, there have already been an astounding 18 deaths at Florida greyhound tracks. If this shocking rate of deaths continues, Florida tracks will have more than 100 greyhound deaths by the end of the year. Causes of greyhound deaths included including fatal injuries suffered during or after races, and heat stroke. Fifty-one of the dead greyhounds were under 3 years old; the two youngest dogs were both 17 months old. These majestic, perfectly healthy, gentle and loving animals were essentially run to death. Shockingly, laws in Florida and several other states require gaming facilities to also operate greyhound tracks. This "coupling" tactic -- keeping a failing industry alive by attaching it to a successful one -- is designed solely to keep greyhound racing practitioners and breeders afloat, with absolutely no regard for the animals' welfare. Meanwhile, the entire greyhound racing industry is still sinking. Since 2000, both the number of states with legalized racing and the number of racetracks in operation have been cut in half. In Florida, the amount of money gambled at dog tracks declined by 72 percent between 1990 and 2013. Florida race track operators lost a total of $35 million in 2012, and since 1990, the amount of taxes and fees collected by the state for live greyhound racing declined by 98 percent. Even racetrack owners, tired of losing money on the costly and often poorly-attended racing operations they're forced to maintain, want it decoupled from their other gaming businesses. Who does that leave to support greyhound racing? Only racing dog breeders and trainers, who have everything to gain while everyone else -- especially the dogs -- loses. The ASPCA and GREY2K USA are urging lawmakers to eliminate the coupling mandate so that this dying and deadly industry can naturally expire, as it should have long ago. Some are listening. "Let's be honest about the fact that the only reason we have greyhound racing in the state of Florida is that our laws require pari-mutuel facilities to engage in this barbaric practice simply to keep their licenses," Florida Representative Matt Gaetz told Bay News 9, a local Florida television station. "It doesn't make any sense." But merely cutting the lifeline of greyhound racing isn't enough. We also want the state to pass Senate Bill 742, a greyhound injury reporting law, which will finally make the suffering and cruelty connected to greyhound racing as clear as day. Only Florida and Alabama do not report greyhound injuries to the public. And in states with mandatory injury reporting laws, the frequency of euthanasia can be significantly reduced. In Massachusetts, 43 percent fewer dogs were euthanized in the first year following passage of an injury reporting bill. In year six, that number dropped 88 percent. Though Florida is the virtual capital of greyhound racing, this is by no means a Florida-only problem. Two other strong examples are Texas and West Virginia. In Texas, according to an analysis of state records by GREY2K USA, 1,507 greyhound injuries were reported at racetracks from January 2008 through December 2011. Fifty-six of these injuries were fatal or required euthanasia, with the most commonly reported injury being broken legs. Other serious injuries reported included dislocations, puncture wounds, paralysis, broken necks, a broken back and a fractured skull. The analysis also found inhumane living conditions -- greyhounds forced to live in confined, stacked cages, with large greyhounds being unable to stand fully erect inside; a deadly epidemic of canine influenza that killed six dogs; and routine feedings of meat from diseased animals. The economic value of greyhound racing is also bleak in Texas, where, since 2008, gambling on dog racing has declined by more than 61 percent, attendance has dipped 52 percent, and track representatives freely acknowledge that dog racing is no longer viable. In West Virginia, GREY2K USA's analysis of state records revealed 4,796 greyhound injuries reported at the state's two operational racetracks from January 2008 through June 2013. Thirty percent of these were career-ending injuries, and a total of 289 greyhound injuries were fatal or required euthanasia. The most commonly reported injuries were broken legs, with other serious injuries including muscle tears and broken backs. As in other states, West Virginia's racing greyhounds were confined perpetually in cages too small for large dogs, and fed meat from diseased animals to reduce costs. Also reported were cases of abuse and neglect, with trainers and kennel staff cited for hitting, "violently swinging," and punching greyhounds. Meanwhile, the economic freefall is just as stark. Gambling on greyhound racing has declined by 37 percent at West Virginia racetracks since 2008. And just to show how vile the very concept of greyhound racing is, the Colorado legislature passed a bill last week banning the sport and preventing tracks from opening in the future... even though greyhound racing operations haven't existed in the state since 2008. In 2014, it's bewildering that routine cruelty and the frequent deaths of dogs is considered a reasonable consequence of a legal sport. That it still happens is a national shame, and whether by market pressures or the power of our voices, it must end. If you know a greyhound, it's likely you love a greyhound. Please help save them. Here's how. Matthew Bershadker is President & CEO of the American Society for the Prevention of Cruelty to Animals (ASPCA). Learn more about the ASPCA's mission and programs at ASPCA.org.